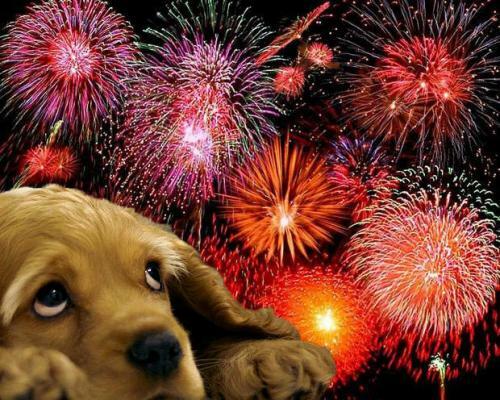 This time of year is often not a happy one for dog owners as many get distressed by the noise. Below are some ideas that may help to get through it as worry-free as possible. Take them out for LOTS of exercise during the day so they are tired in the evening! Feed them a little earlier than usual if necessary. If they are distressed they may lose their appetite and a full dog is often a tired dog! Have a safe place for them to go to in the quietest part of the house and close doors and curtains to keep out as much of the noise and bright flashes as possible. Have the television or radio on slightly louder than usual and play with them to keep them distracted and stimulated. Sometimes a new toy is all it takes to take their mind off everything else! If you go outside make sure they are closed in another room and if you do take them out make sure they have a collar and ID tag on! There are more lost dogs at this time of year than any other! Above all, try to act normally yourself. If the thought of a stressed dog makes you stressed then they will know it! Your pet picks up on unusual behaviour and it will put them on edge before the noise starts when they may not have actually been bothered! This entry was posted in Uncategorised on 5th November 2016 by admin.